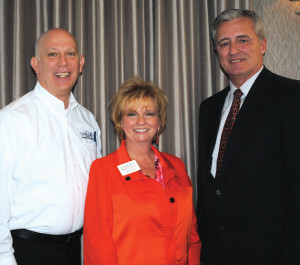 That was Col. Len Waterworth warning Clear Lake Area Chamber members at their monthly luncheon at the NASA Hilton. But after ticking off all the damages caused by Hurricane Ike in 2008, he looked out over the crowd and said the area’s estimated damage from surge was $30 billion. “We can mitigate surge damage.” But help is obviously needed. 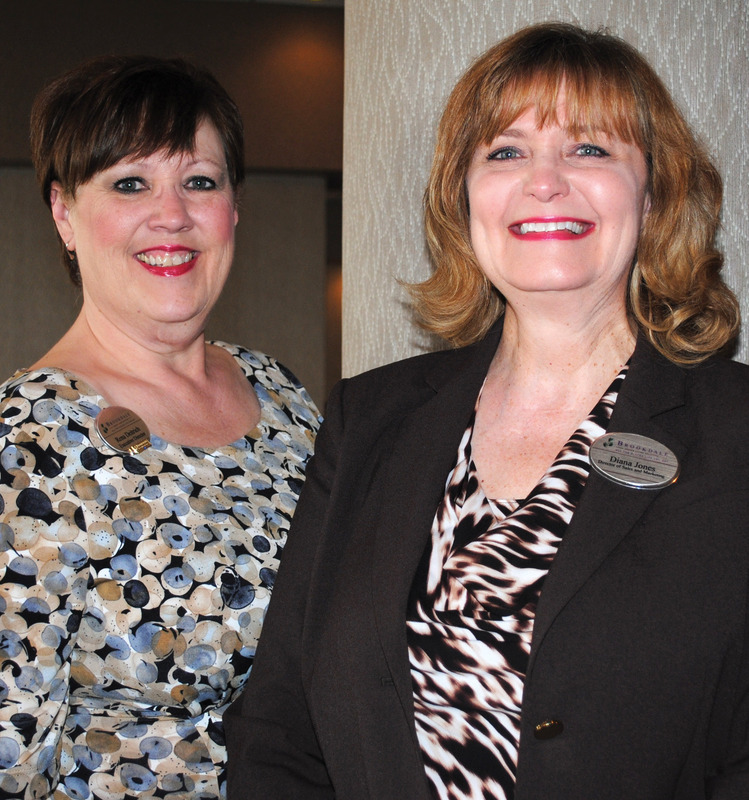 Brookdale Senior Living Executive Director Rena Deitrich, left, and Marketing Director Diana Jones enjoy the Clear Lake Area Chamber Luncheon at the NASA Hilton. “We live in a phenomenal location,” the Texas A&M at Galveston executive professor continued. “People want to come here.” Some 5.4 million people live in our 10-county area. Job creation has been phenomenal. We’re the No. 1 exporting region in the United States. We’re home to the second largest petrochemical complex in the world. Our hundreds of miles of oil pipelines are like arteries in our body. They, too are of national interest. But, he warned, “every 14 years we can expect a 3, 4 or 5 category storm to hit the upper Texas coast. We’re had 71 named storms since 1980, with the majority in August, September and October,” he said, pointing out that Hurricane Ike was only a category 2 storm – yet, because of its storm surge, it was the third costliest hurricane in U.S. history behind Hurricanes Andrew and Katrina. “Our goal now is to provide an actionable plan to deal with surge protection for the Galveston Bay area.” And, the fastest way to reach that goal, he added, is through academic-led surge research, which Texas A&M Galveston and Rice University in Houston currently are partnering on in an effort to get help through special legislation in Austin. 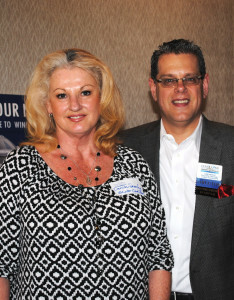 Chris Premont and Denise Stanley were at the Clear Lake Area Chamber luncheon representing Ron Carter Cadillac Hyundai Clear Lake. The next round of Sandy-related legislation may be soon, Colonel Waterworth said, as the U.S. Army Corps of Engineers has completed the $50 million in studies. “Implementation will be costly,” he said. Yet no federal dollars have been used for surge suppression in the Galveston Bay area. As for help for the Bay Area, the thinking is we can probably look for special legislation the next time a hurricane hits. “This is totally unacceptable for the energy capital of the world,” Waterworth said.